C.H.S.S.P. is the Certified Home Staging and Styling Professional Course in association with The Home Staging Network, which provides a professional level of achievement within the Home staging and property styling industry. C.H.S.S.P. study modules are designed to build your knowledge of home staging, property styling, business practice, customer service, marketing of your business and property market awareness. The course is completely flexible and you can study at home at your own pace. All course content, exercises and tutor support is available online through your personal student home page. Emails are not necessary. Students successfully completing the course receive a CHSSP Certificate, a CHSSP logo to use in business documents and a graduate verification web page. The C.H.S.S.P online course provides all the information and resources required to gain the necessary knowledge and skills in professional home staging. Example property projects are detailed in videos and slideshows with full costings, customer details and solutions revealed. An interior design course qualification isn't required to complete the CHSSP home staging course. 10 Reasons to choose CHSSP Home Staging course. "Home Staging is about making a home appeal to the highest number of potential buyers in order to sell the property faster for more money. Home Staging techniques focus on improving a property's appearance by transforming it into a welcoming, attractive home with lifestyle and buyer appeal". Are Home Staging Business services needed? Most home buyers search online before visiting their local estate agent. Rightmove alone has over 900,000 properties for sale at any time, so with buyers scrolling through thousands of pictures of potential homes, the way a home is styled and presented really makes all the difference. Does Home Staging increase property value? The UK Home Staging Association Report 2018 survey of Estate Agents and property developers shows 95% said Home Staged homes sold faster than none-staged homes. HSA Report showed 100% of Estate Agents surveyed said that Home Staging increased property price. Property Developers surveyed by HSA UK said 44% of their property had increased above its value by 10% from using Home Staging services. UK's Rightmove shows Home Staged homes secured 8% more than non-staged homes. to other local property not professionally staged. Source: HSR International 2018. 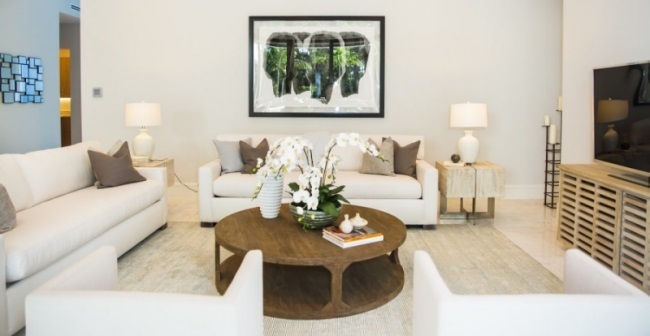 Over 85% of the 4,200 staged homes worldwide surveyed by HSR International saw at least 6-25% more from the sale of their professionally staged home than the home in the same market that was not professionally staged. The largest percentage of results, 68% of the homes actually came in at 9-12% increase..
Home staging statistics at the UK's largest property portal Rightmove, reveal that home staged property secures more viewings and offers, commands a higher asking price and on average sell for 8% more than non-staged homes. On a property worth £300,000, that's a whopping extra £24,000. A professional Home Staging service costs on average 1-2% of the property value. So on a £300,00 home the mid-range cost would be £4,500. and a faster sale resulting in a very good net profit on the investment. What opportunities are there for a Home Staging business? Companies spend millions creating the right image for their products through display and presentation. Professional Home Staging, 'the art of making a home appealing to the highest number of potential buyers', is very popular in the US and increasingly growing as a business service both in the UK, Europe, Australia and throughout the world. CHSSP Graduates include successful Home Staging businesses established in the UK, Australia, Hong Kong, North America, Barbados, South America, Spain, France, Austria, Italy, Serbia, Luxemberg, Czechia, Hungary, Croatia, Greece and Thailand. For many years US Homeowners have used staging companies to get their property sold faster for more money. UK homeowners are increasingly catching on, taking up services and getting into the Home Staging philosophy. The number of UK housing transactions in 2018 were 1.18 million. Those transactions are forecast to rise to a total of 1.3 million by the year 2022. (Source: Gov.uk) In 2018 new build house sales were approximately 200,000. These figures show that almost a million homeowners and investors put property on the market and sold during 2018. In additional a large number put their property on the market but failed to sell. That's over a million properties going to market and available to benefit from Home Staging services. Approximately 200,000 new build properties annually available to benefit from show home staging as property developers increasingly turn to staging companies to get the best price on their investment. Research from estate agent Savills revealed that 53 homes worth over £1 million were sold in the UK every day in 2017. Or put another way, one property worth over £1 million sold every 27 minutes, with a record 19,300 homes sold in this price bracket during 2017. That's a sizeable property portfolio of worth available for Home Staging Services. Author: Anita Richardson, CHSSP Course Director. Founder of the Home Staging Network. CEO of House Wow. Source and Credits for statistics as stated above.